After the faceplant caused by the crappy compound way finishing, I decided to try repairing the tailstock ways as a means of gaining experience before tackling the real problem. 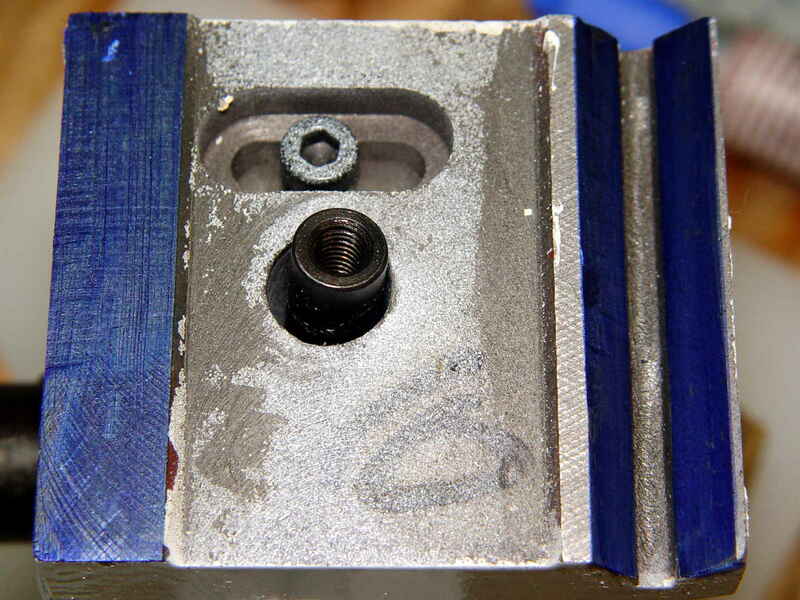 The general idea is to see whether filling the gouges with epoxy will suffice. 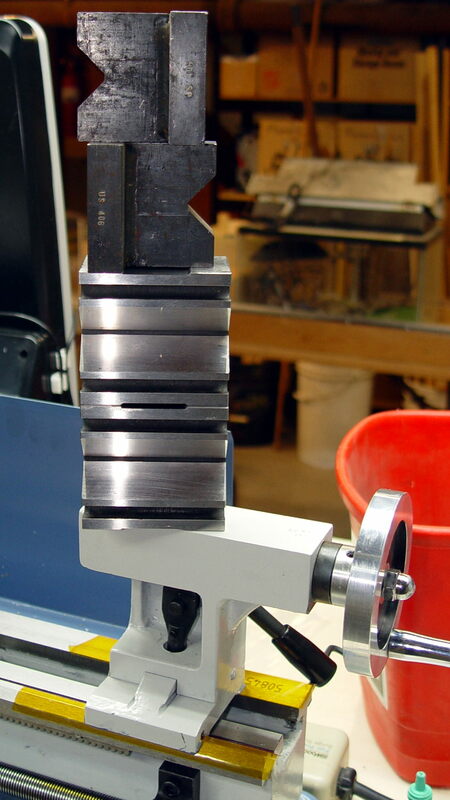 The key point: the tailstock is (astonishingly) well aligned and, if I can manage to not change how it sits on the lathe bed, this should be a zero-impact operation. Scraping / filing / fiddling with the high spots will change the alignment; I expect I must eventually do such things; this represents a first pass at the problem. 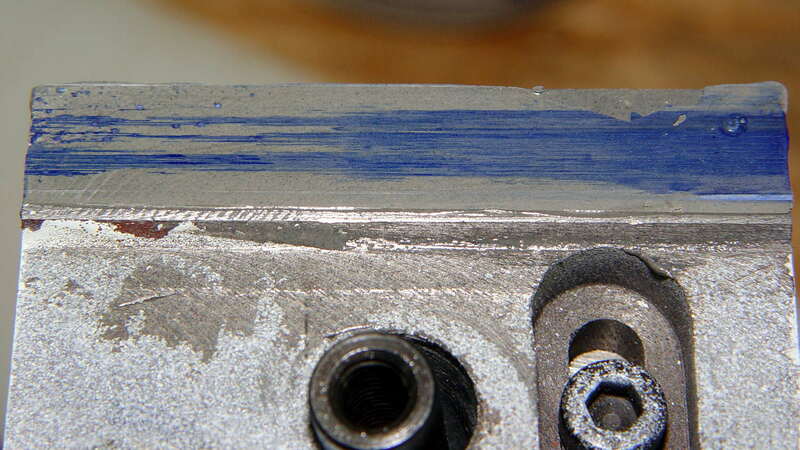 After sliding the tailstock back and forth a few times, the remaining blue shows where the ways did not make contact. Those shiny and silvery spots rubbed against the lathe bed ways. The patch along the upper-left edge and the small dot near the upper-right corner are the only contact points across the entire flat. As nearly as I can tell, that’s actually a reasonably flat and well-aligned surface, with small contact points scattered all over. Granted, there’s a larger contact patch to the left and less to the right. There’s a single point near the top left, another over on the right, and that’s about it. 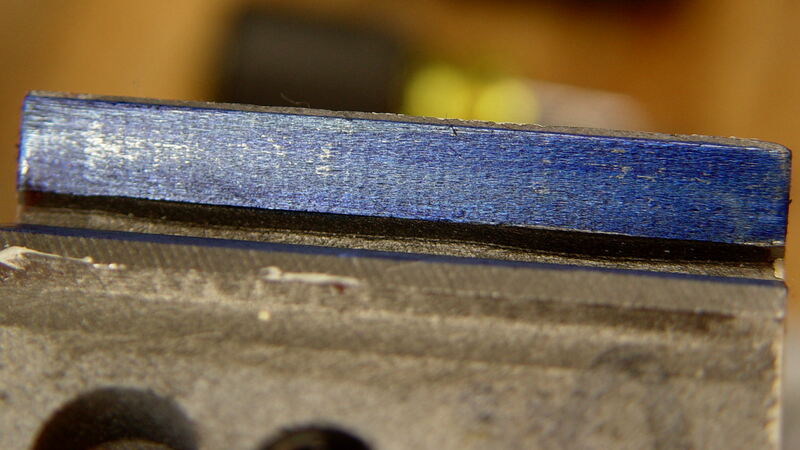 I cleaned the tailstock ways with acetone to get rid of the Sharpie / grease / oil / whatever. Under normal circumstances you’d roughen the surface to give the epoxy something to grip, which definitely seemed akin to perfuming a lily. 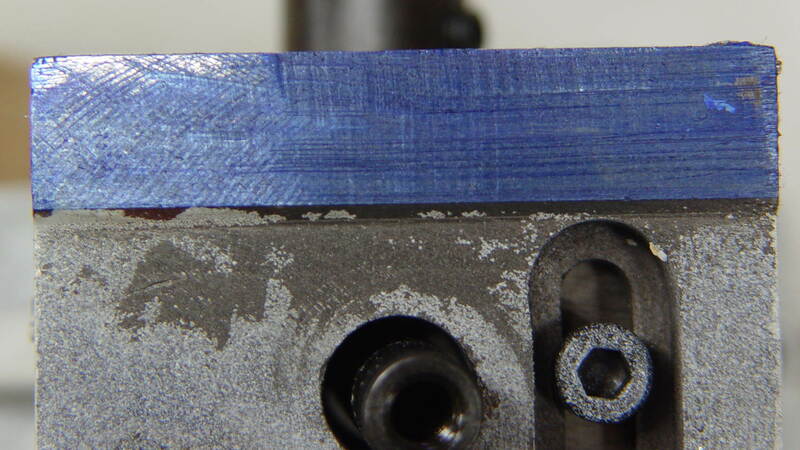 To prevent permanently affixing the tailstock to the lathe, some folks put a generous layer of oil / graphite / soot / release agent on the lathe bed ways. 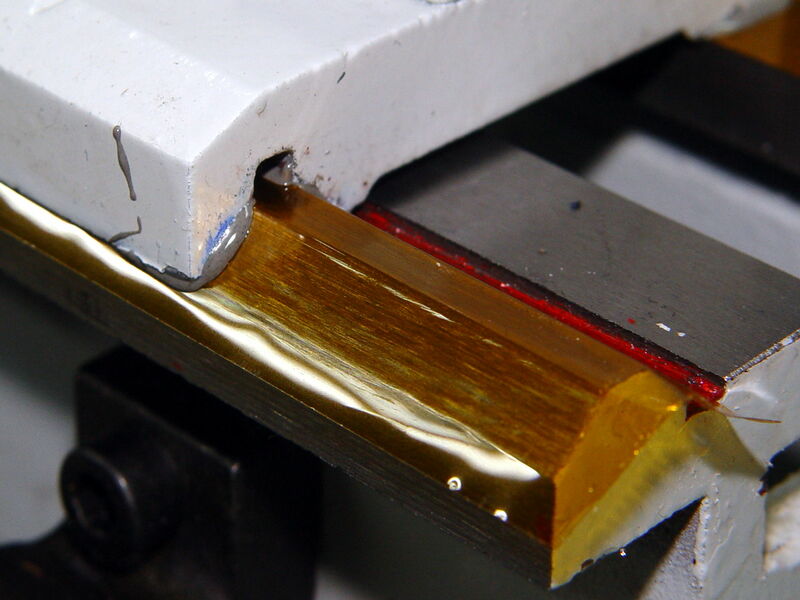 I used some 3 mil = 0.08 mm Kapton tape, figuring an impervious layer would pretty much guarantee I could get the tailstock off again, no matter what. Do other things for 24 hours while the epoxy cures, pry the tailstock loose by hammering The Giant Prying Screwdriver between the lathe bed and the underside of the tailstock (just right of the V-groove, where nothing slides on the bed, but I did use a bit of plastic as a shield), chip off excess epoxy, clean things up, etc, etc. 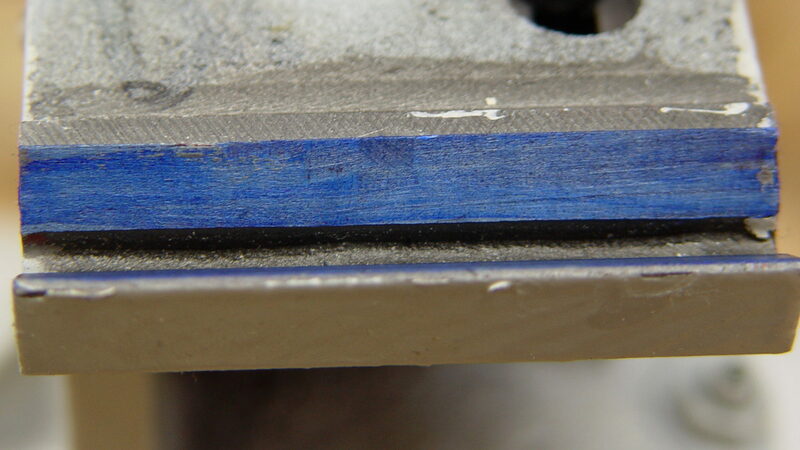 This time, I applied Sharpie to the lathe bed, then slid the tailstock back & forth a few times. As a result, the blue areas now show the contact patches and the gray areas just slid by without touching. That round dot over on the right seems to be a steel protrusion; I think it’s part of the same lump appearing in the “before” picture above. 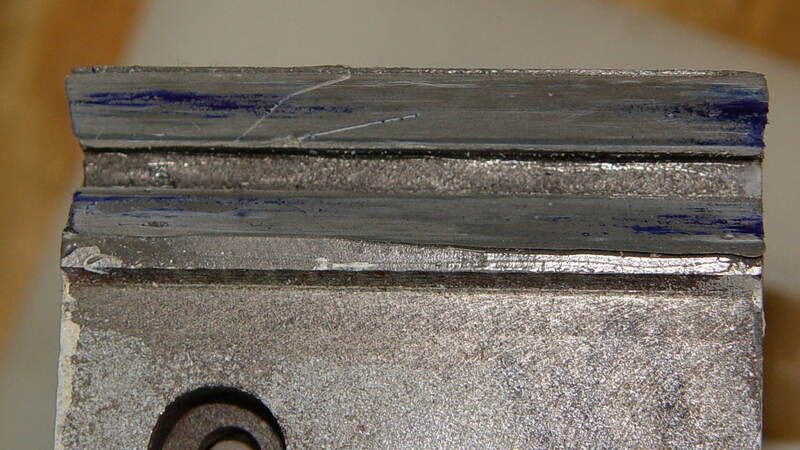 That rather sharp point seems to have indented the tape and produced a low area in the epoxy around it, which may not matter much: it was the only contact point before I did this. On the upside, the ways have much, much larger contact patches spread across nearly their entire lengths, which isn’t to be sniffed at. 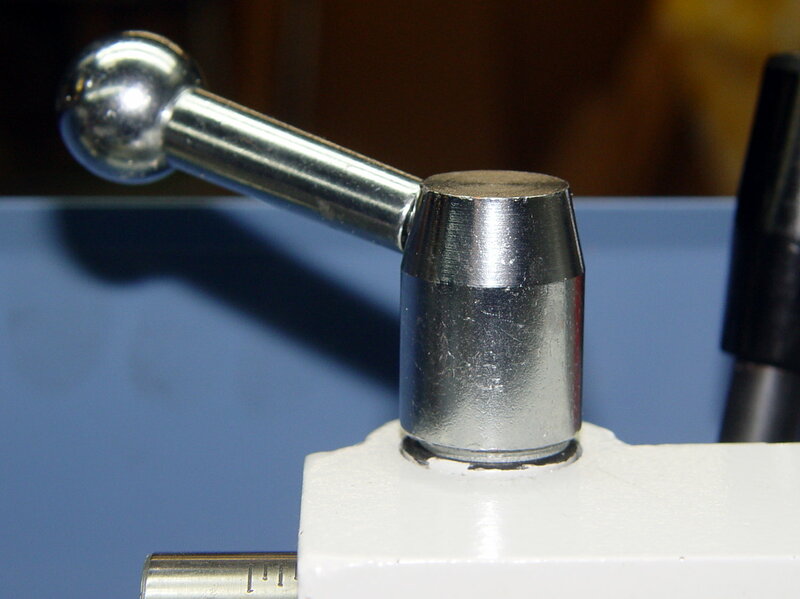 Which definitely calls for a small bushing, of course. 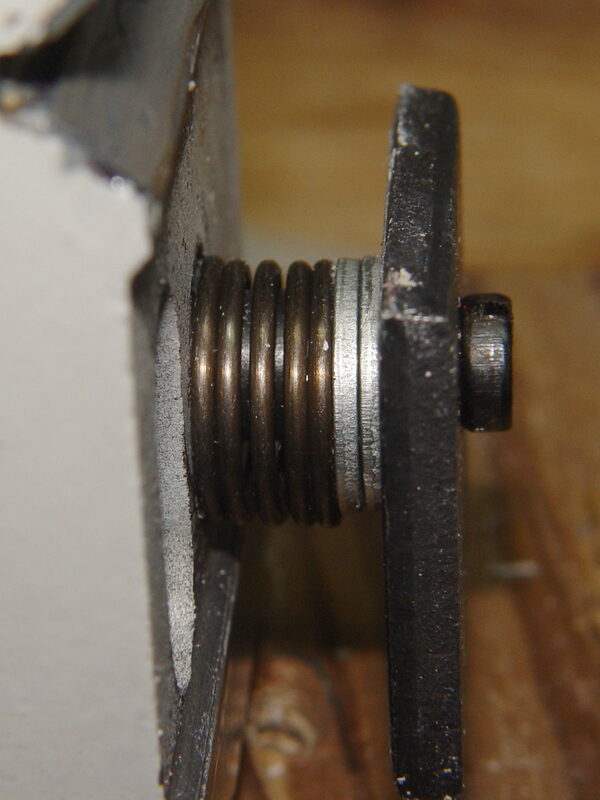 If you put a lockwasher under the screw head, it won’t clear the end of the bed casting. So it goes. I slobbered some Mobil Vactra #2 Sticky Way Oil (thanks, Eks!) on the bed ways, snuggled the tailstock in place, and wow does that thing move! Verily, it slides smoothly and clamps solidly in place: a tremendous improvement over the status quo ante. All in all, though, this worked much better than I expected! A streaming media player in the Basement Laboratory Warehouse Wing has a concrete block wall between it and the WiFi router, so that even high(er)-gain USB antennas can’t grab enough signal for reliable streaming. After some fiddling, I snaked a cable from a hub, along the floor joints, to the Pi and declared victory. It turned out the Pi, an old Pi 1 Model B, had some trouble keeping up with the times, and I eventually swapped it for a Pi 3. Forcing a static address for the wired port followed the now-standard recipe, with eth0 instead of wlan0 in /etc/dhcpcd.conf. Removing my WiFi credentials from /etc/wpa_supplicant/wpa_supplicant.conf prevents the hardware from connecting before the hammer comes down. Yeah, some jerk ran a snowmobile up the slope around the tree, leaving a pile of dirt on the ramp. So it goes. 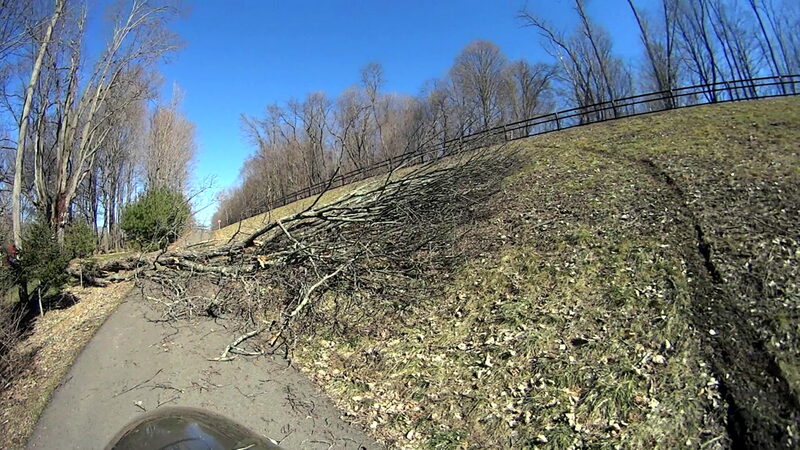 We took an alternate route, I emailed The Right Folks, and (most of) the tree vanished two days later; evidently, the property owner gets to deal with everything to the left of the line of trees. At 200 mA/div, the top trace shows a bit under 1.2 A, a bit under the 1.68 A = 28 × 60 mA you’d expect; in round numbers, each RGB pixel draws 43 mA. Actually, the WS2812 specs don’t specify the maximum / typical LED current and, on belief and evidence, I doubt these units meet any particular specs you’d care to cite. 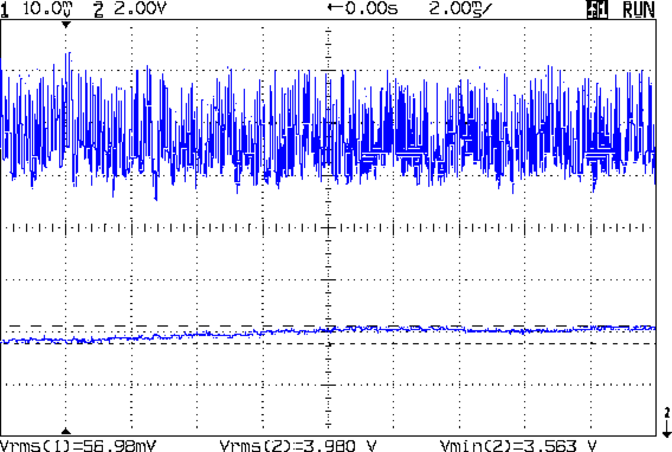 Also, the supply voltage (measured across the LED array “bus bar” wires) hits 3.37 V, well under the 5 V you’d expect from a USB charger and less than the 3.5 V called for by the WS2812 specs. 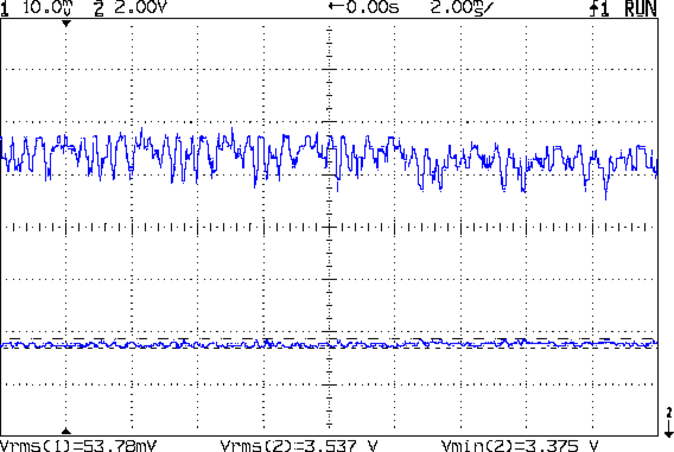 Although the WS2812 nominally limits the LED current, there’s no telling how it varies with supply voltage. 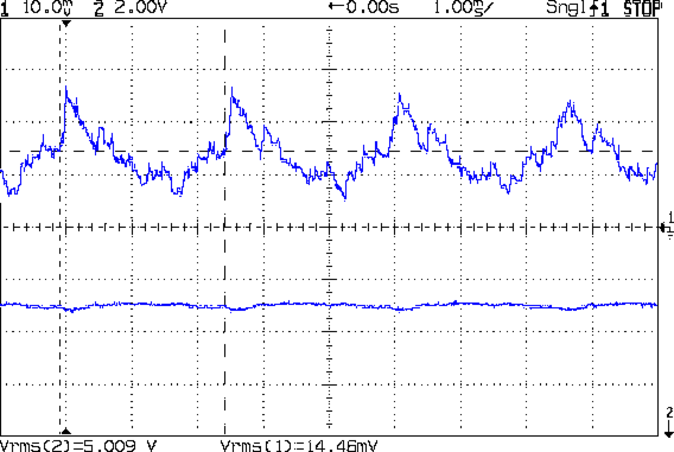 That’s with an additional 20 µF of tantalum capacitance across the power bus bars. 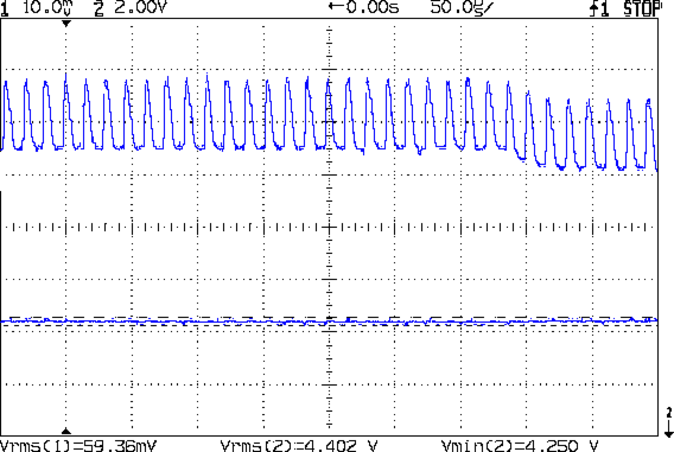 The peak current looks like 1.4 A, with marginally more supply voltage at 3.56 V.
The step over on the right looks like a single RGB LED going dark, as it’s about 50 mA tall. 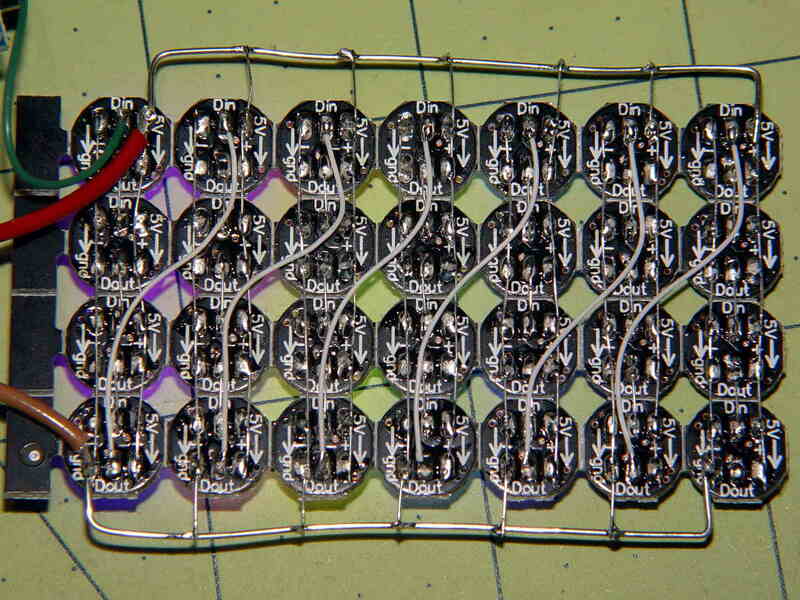 The output voltage doesn’t show the same spikes, so the LED array acts like a constant-voltage load. 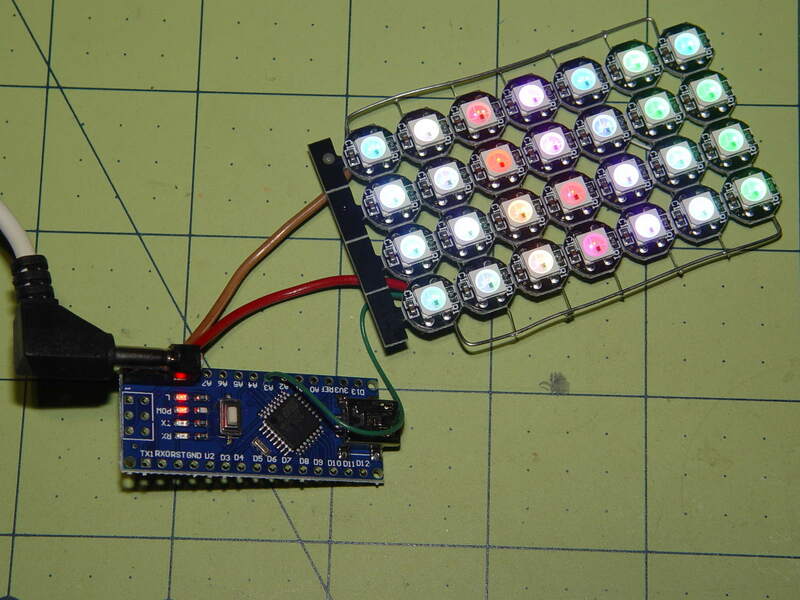 Given that the WS2812 probably connects all the LEDs pretty much straight across the supply, that’s not far from the truth: we’re looking at the forward drop of those blue LEDs. The power wires along the array edges slide into the rear (thinner) slot, with enough friction from a few gentle bends to hold the whole mess in place. The knockoff Arduino Nano rests on the recessed ledge in the pit, with M2 screws and washers at the corners holding it down (the PCB’s built-in holes might work with 1 mm or 0-90 screws, but that’s just crazy talk). I soldered the power wires directly to the coaxial jack pins under the PCB; they snake out to the LEDs through the little trench. 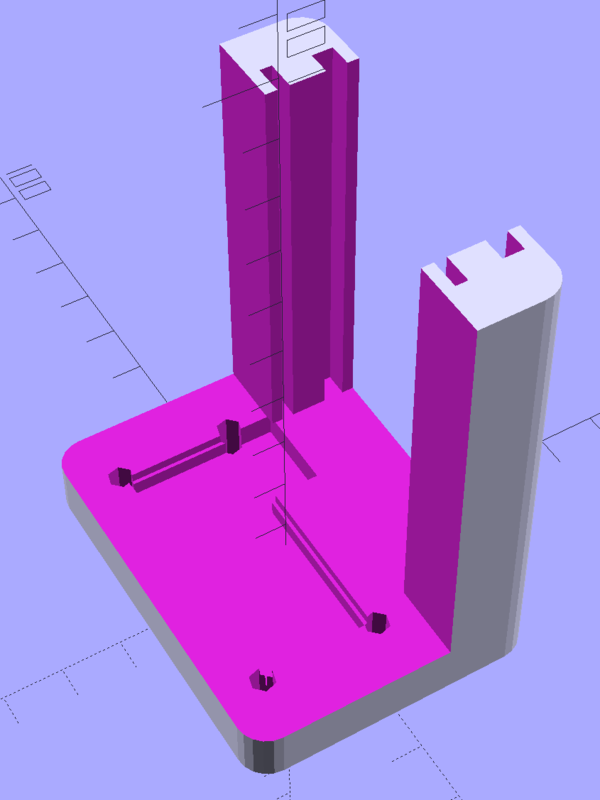 There should be another cutout around the USB connector for in-situ programming, although the existing code works fine. 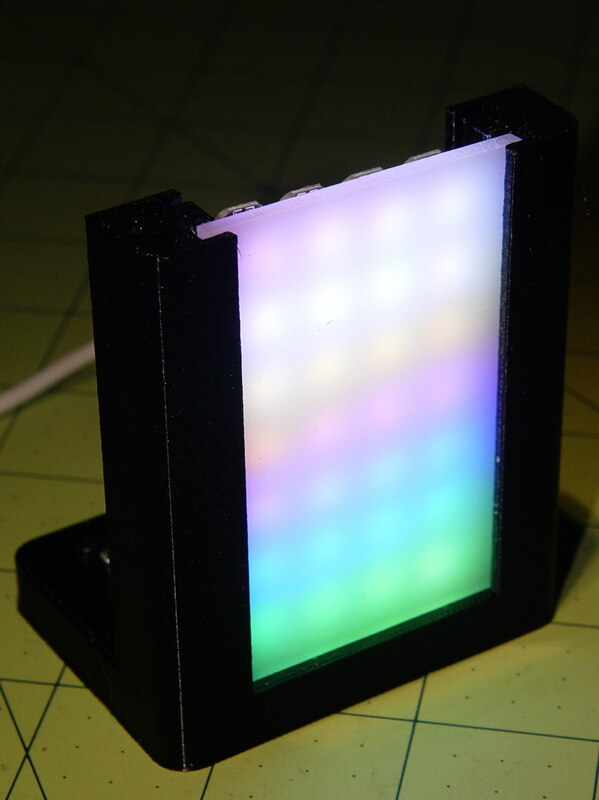 It’s painfully bright: a few layers of neutral density filter would be appropriate for a desk toy. The array runs hot enough at MaxPWM = 255 to produce a gentle upward breeze. 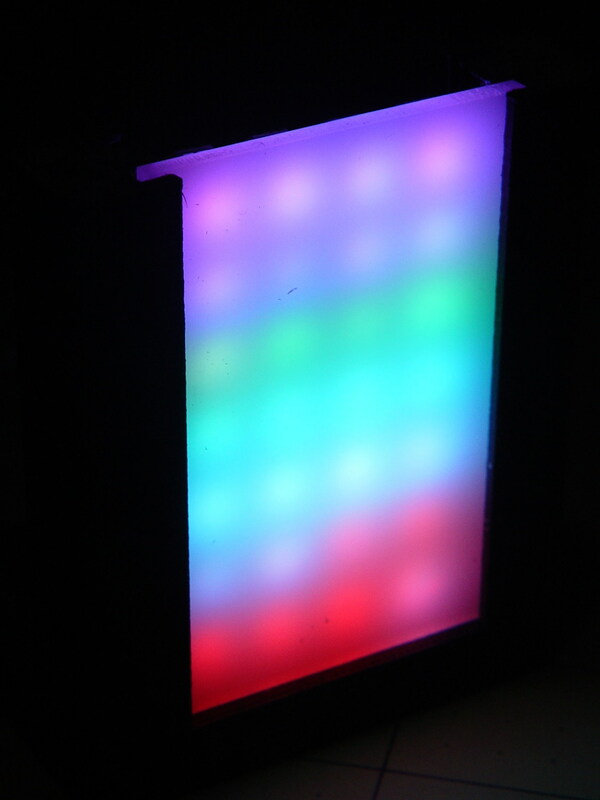 You’ll find many easier ways to get RGB LED panels, but that’s not the point here; I’m waiting for these things to die an unnatural death. Sometimes, one of our homebrew streaming media players will emerge from reset without starting up properly. 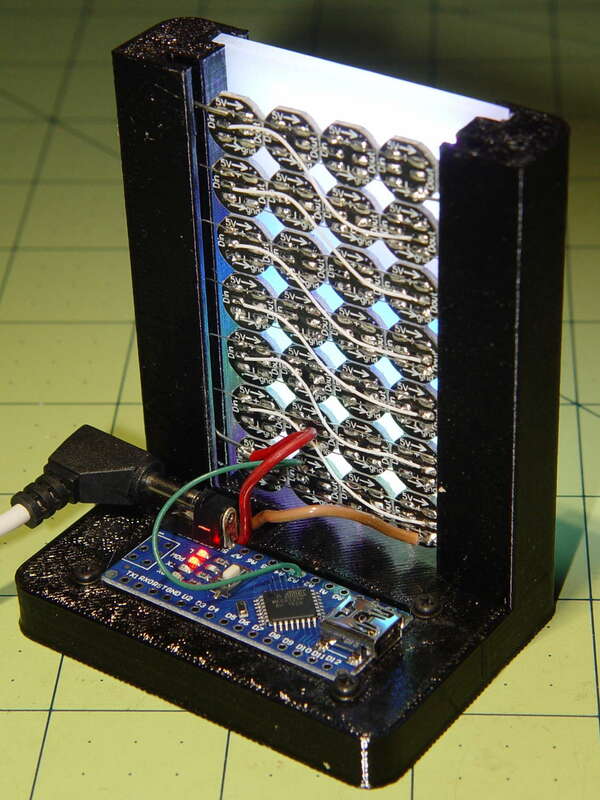 The system board LEDs blink more-or-less normally, but the WiFi activity monitor seems … odd. This post documents the results of some exploratory surgery hinting at a possible solution. I set the router’s DHCP server to assign a fixed IP address to each of our homebrew streaming media players based on its MAC address. That seemed less horrible than setting a static IP address in each player’s configuration, although I could see advantages to either approach. For streamer1, the player discussed here, the IP address is 192.168.1.101; that’s a non-routable address used only on our network behind the router. [  OK  ] Started LSB: Raise network interfaces..
[  OK  ] Started ifup for wlan0. So, having the router hand out IP addresses doesn’t quite work the way I expected. The Pi awards itself a link-local IP address before getting one from the DHCP server, presumably because the vast Linux startup Pachinko machine has a race condition. Alas, the pseudorandom LL address doesn’t fit in the 192.168.0.0/16 network handled by the router: the Pi can’t connect to the network. My code in /etc/rc.local starts the streaming player immediately after the default code displaying the IP address, thus joining the race condition: if the player starts up before the DCHP server assigns the proper IP address, it can’t connect to the music server out on the Interwebs. My code includes a retry loop with a five second delay which eventually connects, at least most of the time, but sometimes gets wedged. The most reasonable fix seems to involve forcing a static address on each Raspberry Pi, so it can immediately connect to the network, without any negotiation, and get on with the business at hand. The router doesn’t support IPV6 and there’s no point in using it. Bonus: less log clutter. Double Bonus: startup happens faster! The timestamps in the first five lines date back to the previous shutdown. The Pi remains plugged in and powered while it’s reset, which apparently preserves the system clock variables, albeit without a hardware clock ticking along: time stands still between shutdown and restart. In this case, the IP address situation worked itself out before the player started, but the NTP clock reset on the sixth line happened at least three seconds after the log began. Feb 14 08:42:24 streamer1 avahi-daemon: Registering new address record for 192.168.1.101 on wlan0.IPv4. Feb 14 08:42:24 streamer1 avahi-daemon: Withdrawing address record for 169.254.14.12 on wlan0. Feb 14 08:42:24 streamer1 avahi-daemon: Leaving mDNS multicast group on interface wlan0.IPv4 with address 169.254.14.12. Feb 14 08:42:24 streamer1 avahi-daemon: Joining mDNS multicast group on interface wlan0.IPv4 with address 192.168.1.101. Given the timestamp resolution, NTP (or systemd) apparently resets the clock three seconds after the IP address changes. That may be as good as it gets, if only because the NTP daemon must find its servers, evaluate their status, then whack the local clock. After forcing the static address, things look better, but it’s too soon to be sure. Many things can clobber streaming, not all of which happen on this side of our router.